Today everyone wants to use have one website for their business because it is one of the best ways to showcase your business products and services to the people around the world. But sometimes you may see that you get this message on your computer screen-- HTTP Error 503.0 - Service Temporarily Unavailable. You get this error in Windows shared or VPS hosting, Mainly We use Plesk control panel for all the Windows based hosting account. You may find this issue if you have not used the right ASP. net application and also right PHP version in your website. 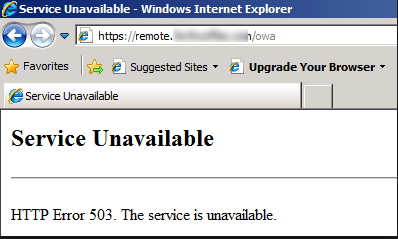 And sometimes due to the permission in an application like IIS users, network etc. If any of your application is using more resources that which is allocated to you then you might face this 503.0 HTTP error issue. You may also find this issue due to heavy load of traffic that is stopping it from properly serving all incoming requests. To overcome this HTTP Error 503.0 - Service Temporarily Unavailable issue you can optimize your applications, and see that all the application have been optimized so that you will not face this issue again. If you are using the dynamic website then we suggest you to go with our Dedicated or VPS servers. You can also overcome this issue by updating your software regularly. So that if there are any malicious software and spam which trigger to get 503.0 error will be stopped. By using the up to date software on your hosting you can prevent malicious software entering your website and also helps you to prevent your website from getting HTTP Error 503.0. You can also fix this problem by detecting the bugs and fix programming errors in your hosting. Because in Windows shared hosting there are default plugins where you cannot change but whereas in Dedicated or VPS servers you have the full control over your server and can you can change the settings as per your requirements. Today most of the people want to use the Windows hosting service for their website the reason behind it in Windows is designed by the Microsoft. And in Windows hosting platform you can run an application using .NET infrastructure, ASP and SQL Databases. And today if you are looking for best Windows hosting provider for your website then you are at the right place. Here in HostingRaja, we provide best Windows hosting service at an affordable price and also with amazing features. With our Windows hosting service, you get discounts upto 55%. So what are you waiting for get your Windows hosting from India's #Best Windows hosting provider.